The health benefits of Calamus Essential Oil can be attributed to its properties like anti rheumatic, anti spasmodic, antibiotic, cephalic, circulatory, memory boosting, nervine, stimulant and tranquilizing. The use of Calamus was known to ancient Romans and Indians and it has made a significant place in the Indian system of medicines, called the Ayurveda. Calamus is a plant that preferably grows in watery, marshy places. It is a native to Europe and Asia. Botanically, Calamus is known as Acorus Calamus. Its essential oil is derived from fresh or dried roots through steam distillation. The chief components of this essential oil are acorenone, alpha calacorene, alpha aselinene, beta gurjunene, beta asarone, calamendiol, calamusenone, camphone, iso shyobunine and shyobunone. The Essential Oil of Calamus has many medicinal properties which are enlisted below. * Anti Rheumatic & Anti Arthritic: This oil is particularly stimulating for the nerves and the blood circulation. It stimulates and increases the rate of blood circulation in the affected area and gives relief from the pain and swelling associated with rheumatism, arthritis and gout. * Anti Spasmodic: The Essential Oil of Calamus is known for its anti spasmodic properties. It relaxes all sorts of spasm, but is particularly effective on nervous spasm. So, in cases of nervous afflictions and disturbances, this can be administered, but in very mild doses. * Anti Biotic: Due to its more toxic nature, Calamus Essential Oil does not allow any bad bacterial growth and acts as an anti biotic. This property can be used to fight infections, both internal and external. * Cephalic: This essential oil has a refreshing effect on brain (of course, when taken in very mild doses, else the effects may be devastating on the brain). It activates it and is also effective in curing neurotic disorders. This oil is also considered to induce and promote positive thoughts. * Circulatory: Being a stimulant, this increases blood circulation and helps nutrients and oxygen reach every corner of the body. This circulation also stimulates metabolism. * Memory Boosting: The Essential Oil of Calamus has memory boosting effects. This can be administered to those who are undergoing or have undergone memory loss due to ageing, trauma or any other reason. This also helps repair certain damages done to the brain tissues and neurons. * Nervine: Most of the effects of this essential oil deal with brain and the nervous system. So, as expected, this oil is a nervine and helps maintain good health of the nervous system. It helps recover them from shock and other damages. It also reduces chances of epileptic and hysteric attacks, nervous afflictions etc. 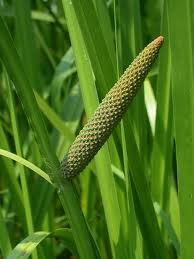 * Stimulant: The Calamus Essential Oil is particularly stimulating for the nervous system and the brain. It stimulates nerves and the neurons and helps attain alertness and steadiness. It also stimulates certain discharges such as those of hormones, blood circulation and other functions going on inside the body. * Tranquilizing: A low dose of this oil can induce sleep and work as a tranquilizer. This may be of great help to those who suffer from sleeplessness or insomnia. This effect relaxes the body and the mind and helps get a good rest. * Other Benefits: It can be used to treat neuralgia, which is caused due to the pressure exerted on the Ninth Cranial Nerve by the surrounding blood vessels, triggering off acute pain and swelling. Calamus Oil makes the blood vessels to contract and reduce pressure on the cranial nerve. Further, due to its numbing and tranquilizing effect on the brain and the nerves, it reduces feeling of pain. This oil is also used for treatment of headache, vertigo etc. and it is a sedative. Few Words of Caution: The Essential Oil of Calamus contains a compound called asorone, which is toxic and considered carcinogenic. It has narcotic effects too and can cause convulsions and hallucinations if taken in higher doses. Studies have shown that its oral ingestion can cause prolonged severe convulsions and tumors. So, oral ingestion should be avoided unless under guidance of an expert practitioner. Pregnant ladies should avoid its use. Blending: Calamus Essential Oil blends well with essential oils of cedar wood, cinnamon, clary sage, labdanum, lavender, marjoram, olibanum, oregano, patchouli rosemary, tea tree and ylang-ylang.